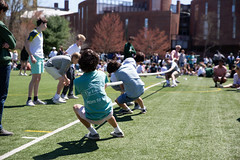 The investigative article, written by Kay Lazar, claimed that Deerfield “remains a place where female students have a sense this is not their Deerfield.” It described the school’s culture as being sexist both on an administrative and social level, citing reports of gender discrimination and sexual assault and saying there seemed to be “a cycle of white male power” on campus. This article immediately sparked discourse within the student body. Many community members did not believe Lazar painted an accurate picture of the Deerfield they know. “It didn’t represent Deerfield now. 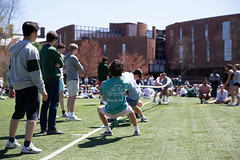 It might’ve represented Deerfield fifteen, thirty years ago,” said Will Holland ‘21. “I would say that I’ve had a very great experience at [Deerfield] thus far. I’ve never felt disadvantaged as a girl at this school,” Kareena Bhakta ‘20 also shared. 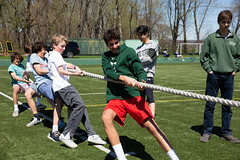 Students were frustrated by Lazar’s references to aspects of Deerfield’s social culture, such as Captain Deerfield only being a male student or a longtime cultural norm that only certain senior boys could stand on the top bleachers at hockey games. This year’s title of Captain Deerfield is shared by a boy and a girl, marking the first year that a female student has held the position. At hockey games, both boys and girls stand in the top row. Many students believed Lazar’s references seemed outdated. While most students acknowledged Deerfield’s gendered culture had been an issue in the past, some were agitated by Lazar’s failure to acknowledge change in recent years and the student body’s desire to progress in a positive direction. “[The article] overlooked efforts the Academy has been taking to address some deep-rooted gender issues. There are things Deerfield is doing that are commendable—steps that the institution is taking in the right direction,” explained Kiana Rawji ‘18. Several weeks after the article’s publication, students shared opinions in an open forum organized by Bailey Cheetham ’19, Emily Henderson ’19, and Mae Emerson ’19. While several students said they continued to experience a toxic culture of gender discrimination on campus and felt the article held true to their experiences, most students described the article as biased and shortsighted. Others argued Lazar failed to take into account the diversity of the student body and the heterogeneity of the Deerfield experience. 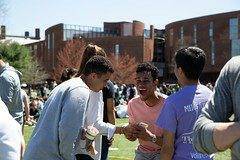 Cameron Heard ‘19 shared a similar sentiment, saying how she “disagrees with the parts [of the article] regarding social influence and social culture, [as] a lot of positive things have happened.” Even in the short four years that current seniors have been at Deerfield, they’ve experienced a significant change in the social culture that Lazar described as “toxic”. In fact, many people believe that Deerfield is not a perfect community, and the article did shine a light on issues that do exist at this school. Even students who were bothered by some of the article’s inaccuracies acknowledged the continued presence of gender issues at Deerfield. More specifically, some students were bothered by the article’s references to sexual misconduct and the way the administration handled such issues. The article revealed several instances where male students were inappropriate towards their female peers. Students were especially appalled by the article’s citing of a disciplinary decision in 2015 regarding a young woman’s reporting of sexual assault by a fellow male student. The male student in question got off with no punishment, as the decision was a “very difficult choice [between] a boy’s future and her feelings,” according to former teacher, Sonja O’Donnell, in her sexual discrimination lawsuit against Deerfield.